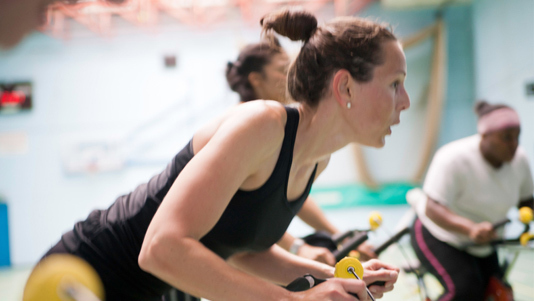 We have a wide-range of exercise classes for you to choose from. Whether you're a pensioner, parent, student, working or unemployed we have a class for you. You can enjoy a lively energising HIIT class or stretch and relax in a yoga or Pilates class. Our qualified instructors will look after you during each class while putting you through your paces. Each class costs £7 (all classes are free on the Platinum, Gold and Bronze* membership). *Except No Strings Badminton, which costs £4. We've tailored our exercise sessions to suit your preference and to make sure your visit to the Academy of Sport is an enjoyable experience. Parents' Gym Session for only £2 - book your child on our After School Programme and you can register for an hour's gym session with a fitness instructor for £2. Terms and conditions apply. Tickets for classes are available from the Academy reception desk up until the class starts. Timetables vary depending on the season. Download our LSBU sport app for a full schedule of classes, to book and keep up to date with any upcoming offers. A ticket must be purchased from the Academy reception desk prior to the start of each class and handed to the instructor to allow admission. Late admission is granted at the discretion of the instructor. Appropriate sportswear (trainers, T-shirt and shorts/tracksuit bottoms) must be worn at all times. In the event of a class being cancelled due to unforeseen circumstances free access to the Fitness Suite or Free Weights room may be permissible pending the completion of a suitable induction.